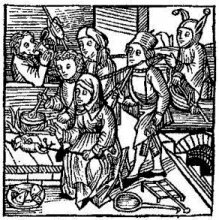 Home Food Research What Didn’t Medieval and Renaissance People Eat? Early 20th century historians were enamored of the mistaken idea that medieval people ate badly, either starving in rat infested hovels or gorging themselves on unhealthy spoiled meat, over-spiced to cover the taint. Through research and careful reconstruction, we now know that our medieval counterparts ate a widely varied and healthful diet. Hygiene and nutrition were very important to them and much time and effort were spent assuring that the food that came to their table was the most wholesome and tasty available. The study of food history is a wonderful way to look into the past and perhaps gain a glimpse of the mindset of our ancestors. What tastes did they value? What techniques did they develop to make food interesting and enjoyable? What ingredients were available to them that are not to us? What cultural influences dictated what foods were eaten? A quick list of foods which were not eaten in Medieval and Renaissance Europe. Tropical fruits such as pineapples mangoes coconuts, & Kiwi, etc. * Items marked with an asterisk were discovered in the New World after Columbus’ voyage to the Americas.